Studying Giotto is a great way to usher in your study of the Renaissance period because he’s the Father of the Renaissance in Florentine art. 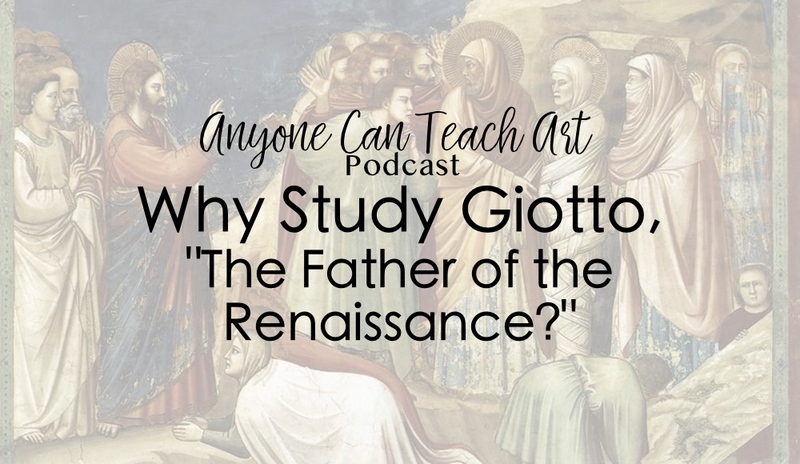 We chat about Giotto’s life, the hallmarks of Renaissance art and some art project ideas for your study of Giotto. In our Personal Renaissance section, we offer some great suggestions for Artsy Gift Ideas. I got a special surprise this summer when I entered one of the little rooms at the National Gallery of Art in Washington DC and saw Giotto’s Madonna and Child! I may or may not have gotten fussed at for getting too close to the painting when taking these photos. (no alarms were triggered though, so I really couldn’t have been THAT close, right? Giotto is known as the Father of the Renaissance because he himself transitioned from the Gothic/Medieval style to the realistic Renaissance style within his lifetime (1267 or 1276 to 1337). Giotto ushered in the Renaissance to the Florentine art scene… or was Florence moving toward an appreciation of realistic artwork and so, Giotto become popular? History is interesting in that we don’t always know which event was the cause and which was the effect. This is a great discussion for your dialectic students. Historians disagree on Giotto’s childhood. There’s a cute story about Cimabue discovering Giotto while he was drawing sheep on rocks. However, most historians no longer believe that story is true. Instead Giotto probably moved to Florence as a child with his family, started as an apprentice in a wood-shop and then moved over to Cimabue’s shop after Giotto’s artist talents were discovered. Uncertainty about history is pretty typical for this time period. Hopefully, we have multiple sources, but that means they don’t always match. All of history is curated to some extent so don’t be too discouraged by it! This is another great discussion to have with your dialectic students. Historians are also not 100% sure if Giotto actually painted some of the works typically attributed to him. For example, in the Life of St. Francises series, historians think Giotto painted some of them as part of a team, but did not lead the team. (Fresco painters always worked in a team.) Everyone seems to agree that Giotto lead the team that created the Arena Chapel frescos. In the end, you’ll want to simplify things for younger students to make the information feel more black and white- you could simply say, “Giotto painted these works of art” and show them the paintings. However, you can go deeper with your older students and encourage them to discuss the ideas and questions. What does Medieval art vs. Renaissance art look like? Medieval art is usually simple and flat. It uses few perspective techniques, little to no background, and no clear or realistic light source. Renaissance art is usually much more realistic and lifelike. The figures have body and the clothing appears to have weight. Renaissance paintings also typically have a background which grounds the figures in the real world. Make sure you have at least an hour to grind your paint, mix it with your binder, and then use it up painting. (Don’t try to save it too long since it’s made with egg!) If you don’t have an hour, decide which part you as the teacher will do ahead of time and which part you want the students to do. Three years ago we did this project. I pre-ground the chalk to save time! Have a very easy painting project for this since the homemade paint will be extra challenging to work with. This is an enlightening project that will help you appreciate being able to purchase paints! Now you’ll know why the advanced apprentices had to the mix the paints- it’s a hard job but the artist wants to spend his time painting. Be sure to draw students’ attention to this. 2. Practice the Renaissance style by drawing/painting something realistic. 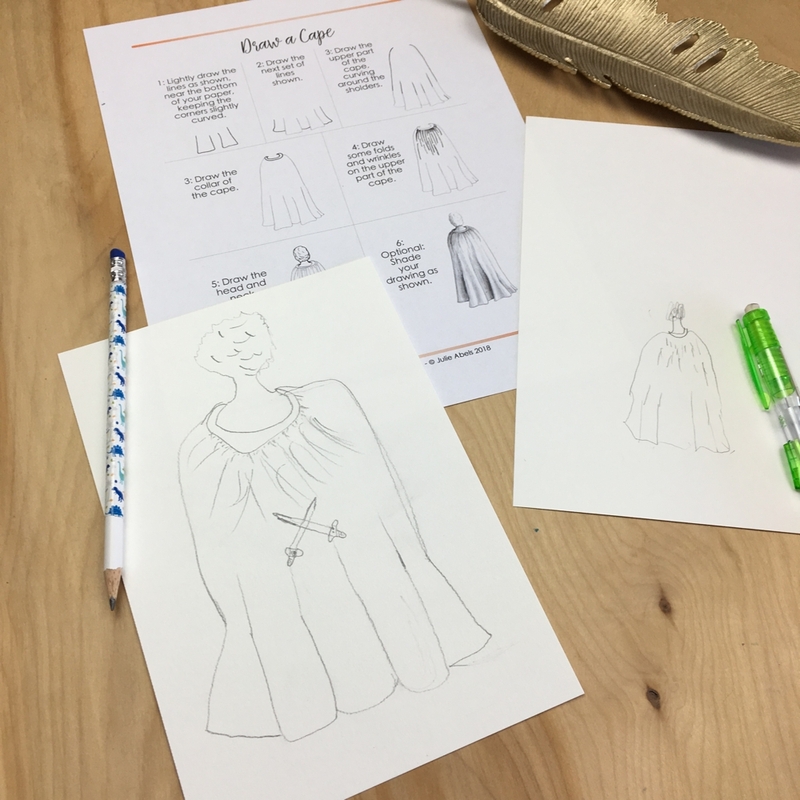 We drew some fabric/clothing, focusing on how to use overlap to create the appearance of folds in fabric. This is a really fun lesson plan that helps students learn to see and learn to draw! You can purchase the full lesson plan in our store. To make teaching a cinch, the lesson plan includes a script about Giotto as well. Check it out for full details of what’s included. I’ve also created a line drawing from one of Giotto’s Arena Chapel frescos. Here’s some great ways to use a line drawing of a famous work of art in your school day. How do we give our kids more art time, even if they don’t ask for it? Deanna had to take her 10-year-old son with her to an advanced seminary lecture. She gave him the choice of drawing quietly, practicing his handwriting, or listening to the lecture. She was reminded of the advice in Nurture Shock about the best way to respond to your kids art is to just notice the stuff in it. Use Shutterfly or a similar service to have your child’s art printed onto something (iPhone case, ornament, pillow, mug…) Have some photos of your art ready and then subscribe to Shutterfly’s emails so you can take advantage of their 24 hour says. The best way to photograph art for this purpose is in bright, indirect light- near a sunny window is usually best. Lay it on a flat surface like the floor, stand on a chair, and take the photo straight down so that it’s square (so the paper doesn’t look like a trapezoid). You can also use a scanner if you have one! We mentioned a few ideas but then afterwards we thought of some more! So we made this into its own post: Artsy Gift Ideas. Check it out and leave some additional ideas in the comments!